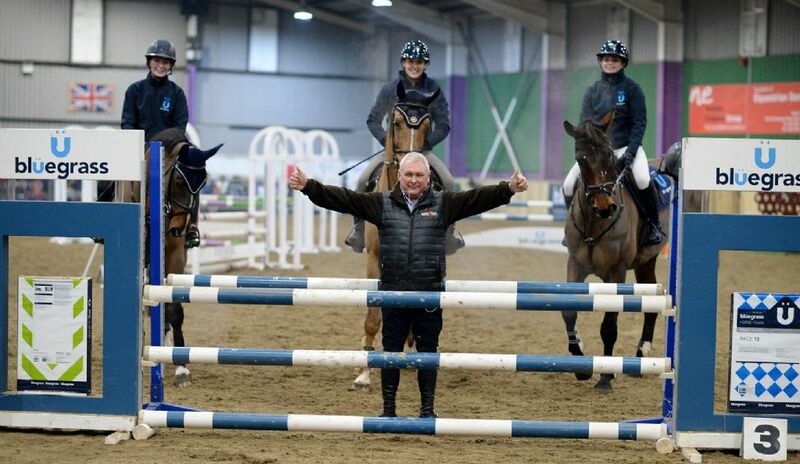 Crowds braved the cold on Saturday night 2nd February, at Portmore Equestrian Centre, Aghalee Co. Antrim, for the Geoff Billington Masterclass. Portmore Equestrian Centre had a packed-out venue on Saturday night to see the world class, Olympic Show Jumper, Geoff Billington. Doors opened at 7pm as the crowds got their seats in the Bluegrass Horse Feeds arena, for an evening full of entertainment and fantastic riding. The evening started with three demo riders, Jessica McIntyre, Makenzie Healy and Vickie Anderson. As the girls and their horses settled in front of the big crowd, Geoff took the time to find out a little more about each horse and what they could do, “to Iron out the creases”. In part two we welcomed back demo rider Vickie Anderson on Zack, Kenneth Graham on Blue and Geoff on Freddie. “The louder the crowd is, the higher the jumps” Geoff quoted during the evening. The crowd held on to their seats as all riders took on the course of fences with ease. Throughout the evening the crowd got the opportunity to see the difference in riders’ techniques and horse experience. Despite being the youngest horse on the night, Vickie Anderson’s 6 year old horse Ivor, didn’t take long to settle down and flourish in front of the crowd. Amending your strides was one of the elements Geoff looked at throughout the evening and this was put to the test for all the riders as they took on the course of fences. Conor Sheridan from Bluegrass Horse Feeds quoted “An absolute honour to see a maestro at work. Plenty of tips and tricks to be taken away and used at home”. Geoff kept the crowd entertained throughout the whole night, with his witty humour and commentary on each rider. The masterclass finished with a prize draw for the Bluegrass Horse Feeds competition held throughout the evening and the opportunity for keen fans to take pictures with the star of the night.